When I first started blogging back in 2010 I didn't have a clue how to use Pinterest to bring traffic to my blog. In fact, I thought of it as a place to save/hoard cute puppy images and as another social media platform for people to follow me on. Fast forward to 2016 and I finally realised that Pinterest is very much a search engine and was a tool I needed to be using! Since then I have constantly experimented with what works and what doesn't and can now happily say that Pinterest brings a huge 7,000-10,000 pageviews to my blog every month! This is a figure I'm beyond pleased although I aim for it to increase over the coming months and years as traffic from Pinterest really is limitless and is all about the consistent effort you put in! So, of course, I wanted to share what I have personally learnt over the past 2-3 years so that you too can have a slice of the Pinterest pie - actually I have wanted to write this post for the past 6 months! From optimising your profile to creating eye-catching pins and even increasing your chances of having your very own viral pin that will bring endless traffic to your blog. I hope this post can be used as an in-depth guide to finally creating Pinterest traffic success! If you're a blogger you will first want to get a free business account here (don't worry you can simply upgrade your personal account) as it will give you access to you own Pinterest analytics. You also want to set up something called 'Rich Pins'. Rich Pins are great, they make your pins stand out from other people's pins and it's totally free - find out how to set them up here. Lastly, make sure to add a widget to your blog so that readers can hover over your blog post images and pin them directly to Pinterest! One of the biggest misconceptions about Pinterest is that it can bring success by purely sharing your own pins. This couldn't be further from the truth as Pinterest in fact loves an engaged user that it sharing more pins from others than that of their own. I personally like to take the 80/20 approach to pinning, mostly pining a mixture of pins from the smart feed, the accounts I follow and the trending page. I also have my own Pinterest boards in mind (maybe my 'Office Inspiration' board could do with more pins) and if there's a holiday or new season coming up. I also make sure I'm re-pinning viral or popular pins most of the time along with pins that are helpful and aesthetically pleasing to keep my own Pinterest boards interesting and of use to others. How often should I be pinning? This is the surprising thing - as much as possible! For the best results, I recommend pinning 30-40+ pins, daily, plus a handful of your own. This may seem a lot but it will yield results and boost how often your own pins are seen by others and will 100% grow your Pinterest followers. There is the option of paying monthly or yearly for a scheduling service called Tailwind that you can batch pin with, say an hour on a Thursday evening, and then schedule them pins to be pinned throughout the week or even month ahead (receive a free 30-day trail here using my special link!). However being someone that has paid for this service in the past I will say I personally found it more of a chore and prefer to pin 10-20 pins twice a day, most days, when I'm sat having a break and at night for around 5-10 mins at a time. However if you would prefer to get a week or months worth of pins out of the way in 1 hour then Tailwind is for you. For casual pinning-on-the-go/when you're procrastinating I highly recommend downloading the Pinterest app for this quick style of pinning as it makes pinning super easy! With the tips in this post which I of course use myself, I now receive an average of 280 daily click-throughs to my blog and over 1.2 million people see my Pinterest account and pins (+800k increase in 12 months) per month! Next is a bit of preparation work for the pins you will be creating in step 3! While this is one of the more boring tasks you will do, it will help you get your own pins noticed and repinned on a constant basis. This is a key step in your Pinterest success! A group board works exactly like a regular Pinterest board. The only difference is that along with the board creator, other invited members are also allowed to pin their own pins. So while you may only have a low amount of followers seeing your own boards you can join a group board that is followed by a much larger audience, thus getting your pins in front of many more eyes. Plus fellow members are much more likely to repin the pins on that board, including your own! Pinterest works on an algorithm that takes the collective number of repins per user and creates a secret repin rate. The higher a pinner's repin rate, the more Pinterest will value them, and the more likely their pins are to get shown on the smart feed and in Pinterest search results! The first step is to find appropriate group boards to join that suit your own blogging niche and ask to join them. For me this would be finding beauty boards and blogging tip boards as I write posts that would fit in with these kind of boards well. However, finding group boards to join can be tricky because there's no obvious way to find them! So for this reason it's good to find popular bloggers in your niche on Pinterest and see if they belong to any group boards. To do this you will need to go their profile (generally found through their blog) and look towards the end of their own boards to see if there are any group boards there. These can be detected as group board either by the name of the board or by the fact there will be a circular thumbnail above the board name containing more than one profile picture - showing it's a board that has more than one member. Side note - as the Pinterest profile I'm looking at is helping me discover some group boards to join I will follow all of their boards as a kind of thank you! Next, you will want to read the rules of the group board you have clicked on and find out the requirements to join. This generally consists of following the board's creator on Pinterest and emailing them through the provided email address to ask to join the board. The creator of the board is always the first circular profile image you see next to the group board description so make sure to click on their photo and follow all of their boards first before contacting them. As for sending group board email requests I think creating a template that you can re-use/edit is a good time saver. Keep the email brief, asking politely to join their specific group board and with the information they require, generally a link to your Pinterest profile or your profile name. Generally it will take a week or so for most group board creators to get back to you or to send you an invite request via Pinterest which you will find in your Pinterest inbox. Once you have accepted the request you are free to pin your own pins to the group board, while saying aware of the boards pin limit per day. You don't want to get kicked out for spamming! The more group boards you can join the better, so when you have time search for more group boards to join, especially as you won't necessarily be accepted to join all group boards you apply to. I'm a member of 21 group boards, however, I currently aim to join 1-3 new group boards per month with the goal being to be a member of around 60-80 eventually! If you write beauty or blog tip type posts then feel free to check out my own Pinterest profile to discover group boards and request to join my own Pinterest group board 'Beauty Bloggers Exposure' which has 4,400 followers. Onto another important step now, getting your images/blog posts re-pinned on Pinterest and possibly going viral! The first most basic step is to ensure that all of your blog post images are vertical as vertical images that are pinned to Pinterest receive more re-pins than horizontal images and simply take up more 'real estate' on Pinterest thus grabbing other users attention. What is the optimum size for a Pinterest pin? Next, you want to start creating longer eyecatching pins that aren't just a pinned image but an image with text - these simply get much more repins as people want to click on them! The text can be the title of your blog post or something more attention grabbing! The ideal pin size is 735 pixels (px) by 1000+ pixels long. Pins can be created with Canva - in fact, they have free Pinterest templates for this very purpose! Or you can use Photoshop or similar. To start I would suggest using Canva as they have over 520 free Pinterest graphic templates where you simply drop in your blog post image(s) and change the text and colour scheme. From there you can progress to using Photoshop to give more design flexibility. You also want to keep in mind the style of pins that do well on Pinterest and figure out what makes them stand out! 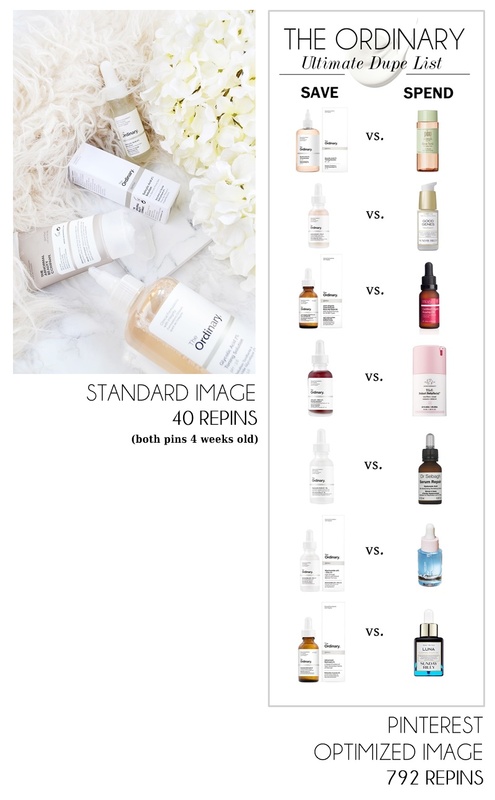 As you can see the above pins are from the same skincare dupe blog post but the longer pin I specifically created for Pinterest has done much better than the main image I included in my original blog post. In fact, it's now at 840 re-pins as it's being repinned by Pinterest users daily! Side note - While checking how many re-pins the pin you have pinned has received is fun also be aware that this isn't the real total number of re-pins as readers may have also pinned the image from your blog and gained repins from their followers. While I can't find the exact number of repins a single blog post receives I can use Google Analytics to tell me how many pageviews its brought to my blog (Pinterest savvy tip below!). So far the above pins from the blog post that's only 35 days old have brought an extra 2,748 pageviews to my blog - not bad at all! Next, you will want to either pin this designed pin manually to your Pinterest blog board using the '+' sign in the top toolbar on Pinterest and then 'upload image' making sure to enter the URL link of the blog post so that people can click on it. Or by including the pin at the bottom of the blog post it's for (like I have done below) to pin it yourself and for others to pin. If you use Wordpress you can include a hidden pin within your post that only becomes visible when someone clicks to pin any one of your other images in that post - find the tutorial for this here. Once your blog post is live will want to boost your pin or at least one of the images in your blog post (if you decide you don't have time to create an extra designed image/pin). This can be done by pinning your own image from your blog post using your built-in widget or going to Pinterest and uploading the images directly (remembering to include the blog post URL). This pin should first be pinned to your dedicated blog post board. From there you want to decide if the pin fits in with any other boards you have, for example, an image from a Winter beauty post could be pinned to my 'beauty' board and my 'Winter' board. Giving me an instant 3 repins on that pin. Next, you want to pin your especially created pin to a few of your group boards. Then with the aim to pin it to the other group boards it will suit over the next few days or week, due to the 80/20 rule I mentioned in step 1. This will mean that without anyone else pinning your blog post images you have secured quite a few repins on your own and increased the chances of how many ppl will see and repin your pin dramatically. This is what will get your pin to take off and ultimately can lead to them going viral. My own most viral pin has received over 85,000 repins and brings daily traffic to my blog! However, while that doesn't happen often you are looking for lots of your pins to do fairly well so that collectively they bring you a steady flow of traffic. To track your daily traffic from Pinterest via Google Analytics (to see if your efforts are working!) click 'Acquisition' > 'Social' > 'Overview' > Pinterest. Here you will also be able to see which pins are bringing you the most traffic. If you find creating pins for every blog post a bit too time consuming (or maybe you want to go the extra step!) then it's a clever idea to look through your Google Analytics or blog stats to find your most read posts. They are your most popular for a reason so they are likely going to be enjoyed on Pinterest too. To create an eye-catching pin you may want to save the images from the blog post you've decided to re-promote and use these in Canva or Photoshop along an eye-catching text overlay. Then place it in your blog post and pin it as you would a new pin to both your own board and the group boards that the pin suits best! While you can do this whenever you want if the blog post is holiday or season related I would wait until a month or more before that holiday/season has arrived to upload the new pin, in hope that content will be more current and valued by Pinterest and it's users at that time. Once you know what is well received on Pinterest you may want to experiment with creating more than one pin for each blog post (though still include only one pin at the bottom of your blog post and not both pins). These should contain different images and text, something that's not the title of your blog post, and basically don't look the same! This effectively increases the chances of your post/pins being re-pinned. Often one pin out of the two you have created will do much better than the other even though they lead to the same post. Side note - This is also a great way to see exactly what style of pins work best for you, so you can recreate it with further pin designs. Similarily, once a pin that has done well starts receiving less repins you can often recreate that success my creating another new pin. For example, this pin received 16,000 repins, once I started to see slower growth I created this pin for the same post and it has so far received 2,300 repins and counting! Lastly, pins with descriptions are often said to do better than those without! This can be done when writing your blog posts in the 'search description' field of your blog editor and will appear on pins that are pinned within that post and Google searches. Or you can go to an existing pin on your Pinterest profile, click the pencil icon, and add a description including keywords from the title in a natural way to help give it an extra SEO boost. While this blog post has covered a lot I do hope this has been helpful to anyone that wants to bring more traffic to their blog! If you have enjoyed this post I'd love if you could re-pin the above image!